Vapor IO today announced the launch of a new hyper-collapsed data center with a unique design and form factor. The start-up is aiming to significantly lower the capex and opex cost of building and running data centers. This is made possible thanks to the mobile and portable nature of its new hyper-collapsed data centers, so a sub-set of data center owners may never have to build another facility while Vapor’s product is available. Vapor wants to do away with rows, take your racks and arrange them in rings. Instead of a hot aisle, you have a hot column. Sounds crazy? Maybe, but Vapor is led by Cole Crawford, whose credits are enough to get our attention. Crawford helped start Open Stack, the open source platform which is reshaping cloud services, and immediately prior to Vapor he was the executive director of the Open Compute initiative, which is redesigning data center hardware, and sharing the results with the whole industry. He’s also no stranger to the idea of a leap of faith: his hobby is free-fall parachuting. So what is Vapor IO up to, and why should an industry so heavily invested in rows of racks believe in it? The cylinder or “Vapor Chamber” emerged because a row of racks creates a problem. One side is hot, the other is cold, and it’s a tough job to manage those temperatures and marshal the airflows. Reconfigure those racks in a ring, and the heat output is automatically contained in a vertical column. Add one fan at the bottom, and you can control the rate at which the air is drawn through the system. Vapor’s first products bring together six 25kW racks, in a cylinder that can be placed on a concrete floor. It’s marginally taller than a 42U rack, but has no great environmental demands. It doesn’t need a raised floor, but is designed on a base plate so existing floors will bear its weight. “We prefer a greenfield site, with a slab floor, but people with a raised floor can adopt this without fear of damage,” says Crawford. This idea is based on efficiency, and Crawford promises the chambers will give anyone a PUE of less than 1.1. And the cylinder is just part of the picture. The real secret sauce is what Vapor IO calls a data center runtime environment (DCRE), a software and hardware combo, including bus bars and connector designs, to manage the physical infrastructure. Crawford doesn’t use the term, but DCRE could be a new approach to the problem that DCIM (data center infrastructure management) has been trying to solve for many years. True to its roots, Vapor io will release a free-to-use open source version (Open DCRE) while developing its own licensed version, called CORE. “We’ve created what we believe is the world’s first and most open out of band management framework,” says Crawford. Open DCRE will be released under the Foundation’s reciprocal licence. “Anyone who modifies it must contribute those modifications back,” says Crawford. CORE and Open DCRE are not limited to Vapor Chambers or Open Compute hardware. By licensing the design, Crawford hopes to get other manufacturers involved. In some ways it’s like the model adopted by silicon chip designers like ARM Holdings. More importantly, Vapor has orders. And as we followed this story over the last few days those orders were growing. The first systems will be built with “Wedge” Open Compute racks, but in future chambers could be built with any system that allows all I/O and connections to be placed on the front panel. No one is climbing inside the hot cylinder to rewire or configure anything. The next rack design to be tested will be VMware’s EVO Rack. Another idea is for higher-power racks. 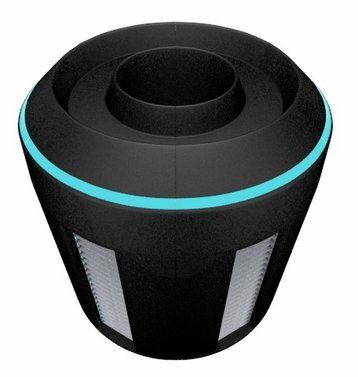 Other plans involve re-using the heat in the circulating air, and a novel hydro ceramic material, which will pull vapor out of the air, managing the humidity as well as the temperature. DatacenterDynamics will be following the fortunes of Vapor IO closely. You can read more about Vapor in the March issue of the DatacenterDynamics magazine.